This recipe from Cooking Light cookbook Grilling was a natural addition to a big night of welcoming the summer heat by cranking up the charcoal. I usually cook one foil pack of sweet Vidalia onions, and one separate pan of whatever vegetables I have on hand. I really liked cooking these vegetables directly on the grill and then combining them with a tangy flavorful marinade sauce after they came off the heat. Stephen gave his approval of the clean taste of the mint mixed with the tang of the vinegar. I used summer squash in place of the zucchini, but either will work great! Combine first 3 ingredients in a large bowl. Sprinkle squash mixture with 1/4 teaspoon salt and 1/4 teaspoon pepper; toss gently to coat. Arrange vegetables in a single layer on a grill rack; grill 4 minutes on each side or until squash is tender and vegetables are well marked. 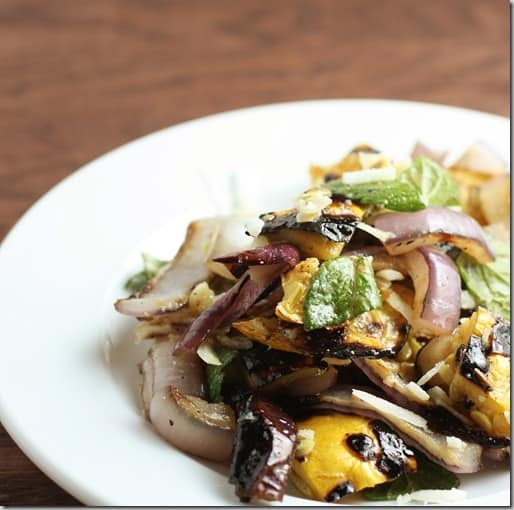 Remove squash from grill; reduce grill heat to medium-low. Grill onion an additional 5 minutes or until tender. Cut vegetables into bite sized pieces. Combine cut squash, onion, and vinegar in a large bowl, tossing to coat. Sprinkle with remaining 1/4 teaspoon salt, remaining 1/4 teaspoon pepper, cheese, and mint. This recipe courtesy of Way to Cook-Grilling from Cooking Light.